As team photographer I’ve been covering regular season games for the Camosun College Chargers men’s and women’s volleyball teams. The season recently came to a close, so I thought it was good time to post my 10 best volleyball photos of the year. I’ve chosen sharp images with clean backgrounds that show the athletes in peak action or at emotional moments. To see photos from the entire year, simply click on any photo. Enjoy! The advantage of photographing college sports is the access to shoot from virtually anywhere I want. To capture this photo I laid on my stomach at the end of the court. I used the back button auto-focus on this member of the Charger’s who looked ready to receive the ball. Using back button auto-focus is key to capturing action shots like these since the players often shift in front of each other after the serve is made. The traditional combination of auto-focus and shutter release on the same button is more likely to focus on the foreground players if they move in front or miss and focus the back wall. I don’t often shoot from the stands – as I did to capture this photo of the Camosun women’s team celebrating – but when I do it is to use the floor as a clean background. The bleachers give a good overall vantage point, but more often I try to explore challenging positions that may not at first seem ideal for shooting. It forces me to try new angles and compositions, so I don’t get stuck in a rut and take the same photo game after game. That way I come away from each match with photos that are new and unique. I try to be invisible when I’m taking photos; I wear black, stay low and try not to make any quick movements. I want the players to forget I’m there. But it’s not always easy. Just before I took this shot, I inadvertently distracted the server as he prepared to let loose on a jump serve (to be honest, I also let loose just not in exactly the same way – I passed gas it happens!). The end result: he shanked his serve – almost hitting the home team’s bench. The hazards of high performance sport: plug your nose if you have to. I’m not sure why female volleyball players wear tight shorts and the men wear baggy ones. During my 15 years on the Canada’s national rowing team everyone wore spandex shorts – men and women alike. But I guess we didn’t do as much jumping as your average male volleyball player. 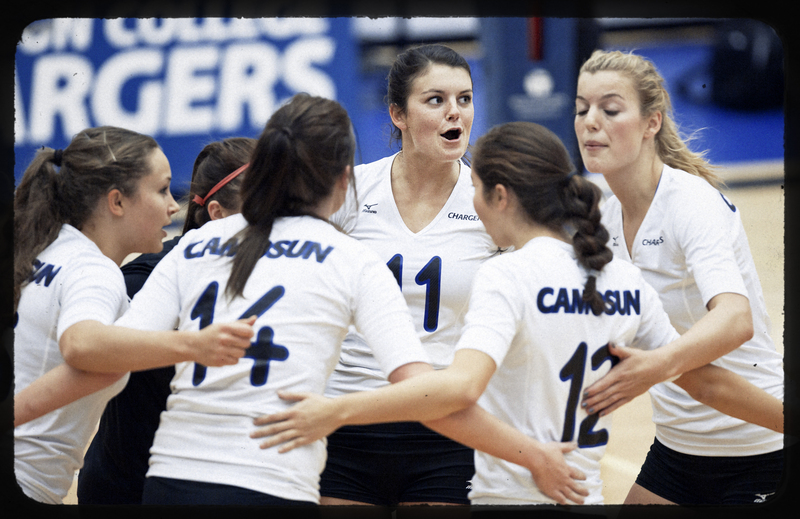 In this photo, the Camosun player is framed nicely by a wall of blockers’ arms. In the end, he snuck between and popped the ball over them using a volleyball play called a “dink.” That’s right: a dink. It’s a one-handed soft hit into the opponent’s court using the fingertips. I can just picture the celebration after this shot as six guys ran together wearing spandex shorts yelling: “Hey George – nice dink!” Only in volleyball. In this photo, the server launches into the air from behind a wall of teammates; the players in the foreground create a strong foundation and the blue padding on wall offers a clean background. To take this shot I again used the back button auto-focus on where the server was going to jump rather than tracking him as he ran since he was hidden behind his teammates until the last second. In sports photography, timing is critical. When I first started pointing my camera at people, I worried about making them feel uncomfortable. That hesitation sometimes meant missing the perfect photographic moment. I’ve become bolder over my career, and now realize that you can’t wait when trying to capture the action or emotion of sport. In this picture, I was at the other end of the court when I saw this player bend over with her face in her hands crying. I ran down the sideline to get closer. Halfway down the court I decided to stop, drop to my knees, and take this shot, then continue down court. By the time I got across from her, she was getting up and the moment was gone. If I hadn’t stopped I might have made it to the ideal spot for the perfect angle, or I might have missed the moment all together. Many of the best photos don’t need a caption – like this one. The expression on the guy’s face in the bottom left of the frame says it all: defeated. With the ball headed at high speed towards the camera, it is always a good idea to keep one eye open following the play and one eye looking though the viewfinder. That open eye has saved me many bumps and bruises over the season. Sports photography is known for action. But it can be those quiet moments in between bursts of activity where the emotion of a sport is revealed. Look at this photo and you see a girl holding a ball. Look closer and you see her furrowed brow – the nervous energy of the athlete waiting to execute a play that she has practiced a thousand times before with no consequence to the outcome. But now she must execute that move with absolute success or lose the game. These photos don’t make the front pages of the sport section, but perhaps they should. It took me three years and the mentorship of a few keen sports photographers and photo editors to open my eyes to the possibility of framing a shot and letting the play fill the frame, rather than chasing the ball in the viewfinder. For this photo I laid on my stomach with the tripod mount flat on the floor, focused and zoomed at the distance I wanted before the play began. I lifted my head and watched the game like a fan. When I saw the peak moment I pressed the shutter – just once. Sometimes it is hard to hold back from firing away on a camera that can take 10 photos per second. It is easy to get wrapped up with the rapid fire technology that you forget to watch – and sense – when the peak action is about to happen. Patience and understanding the game is definitely a virtue in sports photography. Photography is an eye-opening journey into what makes a moment in time special. I learn something with every click of the shutter. The biggest challenge for me coming from competitive rowing to photography has been the independence and lack of feedback I receive. Unlike rowers, most photographers don’t have a coach, and I find myself wanting a space where people can tell me what they think – what’s good, and what I could improve on to become even better. Similarly, in rowing the Olympic games every four years gave me the opportunity to prove I was the best in the world. There’s no Olympics for photographers (unless I get assigned to cover Sochi, I suppose!). I’m only given one life, so I want to make sure I get it right and don’t miss the moments I want to capture.